This page is dedicated to defining micro-pave and showing different styles and ways to achieve the look. 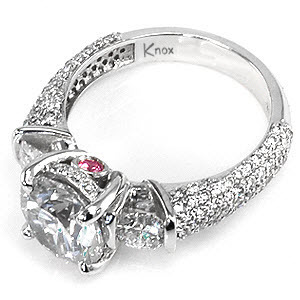 We have hundreds of Micro Pave Engagement Rings and Micro Pave Wedding Bands. It should be mentioned that technically speaking there is much misuse of the term Pave, in fact, the word has incorrectly become nearly a ‘generic’ descriptor of any ring with small side diamonds. Much of the fault for this misuse of the term pave falls with jewelers that do not take the time to educate and explain. In their defense, most jewelers probably find it easier (and maybe smarter) to show a customer what they want to see rather than giving a technical education in setting styles and methods. Show me some micro-pave rings! The term Pave is from the French word Pave (pah-vey), as in paving a street. 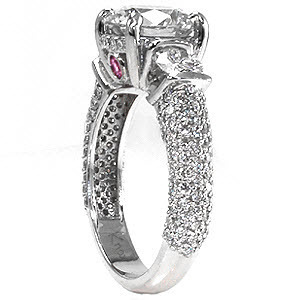 The word was quite descriptive of the diamond setting style in which small diamonds are used to literally pave an area of a ring or other jewelry item. The desired effect is to obtain an area that looks like it is paved with diamonds, with as little as possible metal showing. I would guess that pave setting has been around for hundreds of years, maybe thousands. It is a very low-tech style of setting in which a goldsmith will drill or form holes into the selected area of a jewelry item (or possibly the entire item) and then place the corresponding size diamonds into the holes and then with another tool, form tiny beads (two or more) of metal from around the edge of the diamond and then carefully push these beads of metal over the edge of the diamond to hold the diamond in the hole. While the setting method/style goes back to the earliest days of jewelry making and is therefore quite ancient, the finished product coming from the hands of a master setter can make for some of the most magnificently beautiful and unbelievably intricate designs. It should be mentioned that many purists will only consider an item ‘pave’ or ‘micro-pave’ if the item was made entirely by hand. The major advance that CAD-CAM technology has brought to this process is to significantly reduce the amount of hand labor necessary for the actual setting of these very small diamonds This represents a big advance in time savings in jewelry making methods because of the perfect symmetry and precision the CAD-CAM technologies can build into the wax or prototype. 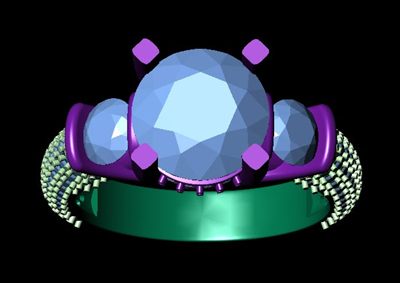 There are still many high quality makers of jewelry that may use CAD-CAM to make a custom project but not use the technology to form the tiny prongs or beads to hold the stones. Instead, they will use a highly skilled diamond setter to meticulously layout the tiny diamonds that will fit into the design and then carefully set by hand each of the tiny diamonds by drilling into the metal and then hand forming beads (prongs) etc. which as shown below is very time intensive and requires Master level diamond setters. 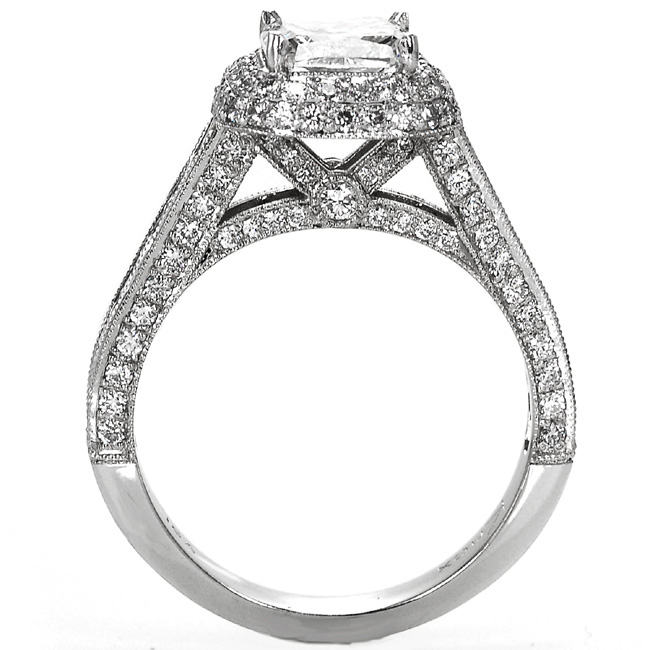 As with most processes, there are pros and cons to each method and the final method of choice used to make a ring is often related to a design specific reason or reasons. Here is an example of micro pave done by hand. There are 136 tiny little round stones all bead set by hand ( under a microscope) All the little beads (prongs) are formed in the metal by the setter. Here is an extreme close-up of part of the design, some of these small diamonds are no bigger than .003 carat ( .80 mm diameter ) or about the thickness of 2 or 3 business cards. The tiny prongs holding these diamonds are a fraction of that size… which is why this type of work must be done under a microscope. 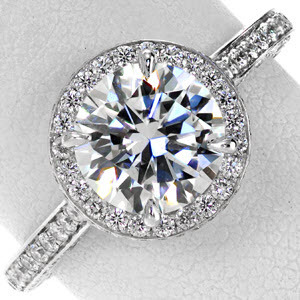 Here is another excellent example of a hand cut micro pave engagement ring. The first two images are from 3-D design software. Solving this geometry puzzle is one of the strong suits of CAD-CAM and makes for very significant time (money) savings. Here are a couple pics of the finished ring that was made with CAD-CAM assisted micro pave. 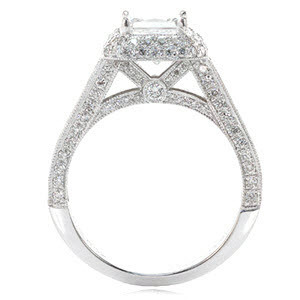 (1) Are micro pave diamonds prone to falling out? (2) Are micro pave designs hard to keep clean? 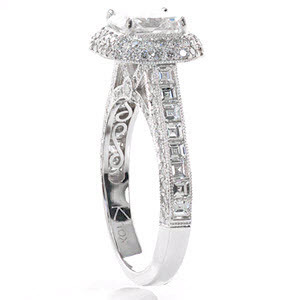 (3) Are micro pave rings harder to size? Are micro pave diamonds prone to falling out? (A) Some micro pave designs may have 100-200 diamonds, which using simple arithmetic, gives many more opportunities for a diamond to fall out. 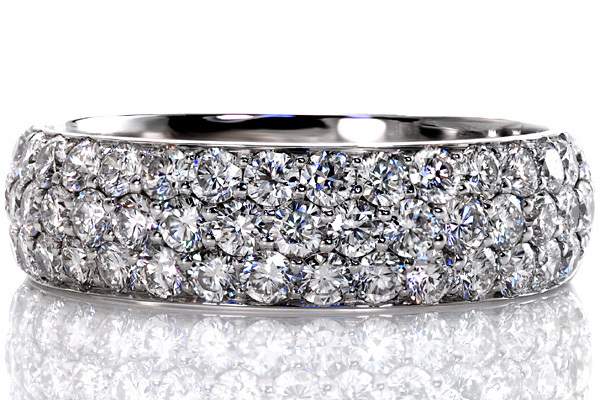 (B) Using the large image of the finished ring earlier in this article as an example, some of the micro pave diamonds are less than 1.00 mm. The prongs holding these small diamonds are a fraction of that and may be better measured in microns. Don’t forget that these tiny prongs are made from a very malleable metal. Bottom line, the amount of metal holding these small diamonds is very small and any direct hit on one of these small prongs or diamonds could easily dislodge a diamond. That said, well made micro pave, when carefully worn and well cared for, can give many years of problem free wear. As with all jewelry, we recommend a minimum of twice yearly inspections. Are micro pave designs harder to keep clean? 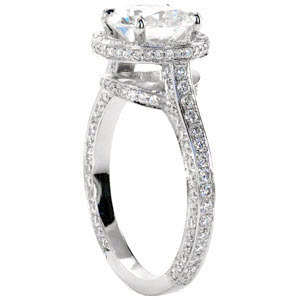 Again, the quick answer is yes (at least, relative to rings without side stones) But, we have thousands of customers that are able to keep their micro pave designs bright and sparkly with just the occasional home cleaning plus the twice yearly visit to our store. Bottom line, all rings will need a periodic cleaning to look their best. Don’t worry about it… wear it… clean it, easy as pie. Are micro pave rings harder to size? Yes, and some may not be sizable at all, so it is prudent to ask this question early in any custom ring process. That said, a highly skilled jeweler is capable of sizing just about any ring. Author adminPosted on May 2, 2007 March 29, 2016 Categories Micro Pave Engagement Rings13 Comments on Pave? or Micro-Pave?